In recognition of 15 years of helping animals in Riverside County, Lori, Peter and AIA was given the Community Hero Award by Animal Services Director Robert Miller during the Annual All-Star Staff meeting. 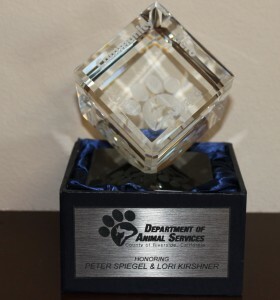 The award was presented “…in grateful recognition of your tireless efforts to improve the lives of homeless animals in Riverside County.” Miller gave heartfelt thanks for the work done by Lori, Peter and the organization they founded in 2001. Congratulations!